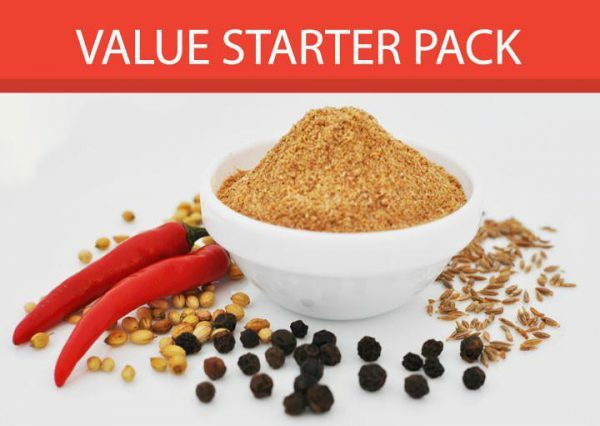 Our value starter pack is a great way to sample all our products, which includes 8 full size variety of our retail spice mixes which includes our mouthwatering Chicken Currey Spice Mix, Chaat Spice Mix, Chana Masala Spice Mix, Yogurt Chutney Spice Mix, Tandoori Barbeque Spice Mix of course our famous Butter Chicken Sauce Mix, Mild and Regular. Our Chicken Curry Spice Mix is a tasty infusion of spices, tomatoes, and onions that delivers the creamy, delicious flavours of South Asian cuisine. With a quick and easy preparation time, this dish is best enjoyed with naan or rice. Our Tandoori Barbeque Spice Mix is a deliciously spicy mix for creating authentic tandoori dishes. This spice mix can be used for baking or grilling chicken and is rich with savory flavors. Our Chaat Spice Mix can be used to add South Asian flavors to any savory or fruity dish. With an easy and quick preparation, this spice mix can be used to make a deliciously tangy snack. Our Butter Chicken Sauce Mix- Mild is the Milder version of the classic Punjabi dish in your kitchen. With a choice of either mild or regular spice, this sauce mix can be prepared within ten minutes. Our Chai Tea Spice Mix brings life to any tea with its classic blend of spices and aromas. With a simple preparation, this blend is an essential must-have for chai-lovers. Our Channa Masala Spice Mix allows you to create the traditional South Asian dish, channa masala (chickpeas). With an easy and quick preparation, this spice mix can be used to make a deliciously spicy and tangy appetizer. Jadoo Yogourt Chutney Mixes are refreshing, creamy and delicious side dishes. Originating from the Indian subcontinent (Pakistan, India, & Bangladesh), yogourt chutneys can be used as a dip for appetizers and entrées such as curries, tandoori chicken, kabobs, samosas, and pakoras.